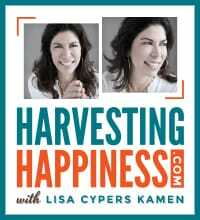 Through her wide-ranging career, Lisa Cypers Kamen has redefined the pursuit of happiness. Documentary filmmaker, positive psychology coach, author, syndicated radio show host, and lecturer, she is an expert in the skill of HARVESTING HAPPINESS even under life’s most challenging circumstances. Lisa’s practice focuses on addiction, trauma, and life crisis recovery, helping clients balance their minds, bodies, and emotions to transform and transcend their Post-Traumatic Stress into Post-Traumatic Growth. She offers a full-range of applied positive psychology coaching services for anyone willing to channel their energies towards a more peaceful, fulfilled, and contented way of life. Her practice includes one-on-one positive psychology coaching sessions, recovery companion transition and transportation services, as well as group facilitation, motivational speaking and training.